Il ya une immense terrasse sur la propriété pour shuffle board et diverses activités pour les enfants. Cette unité dispose d'un placard rempli extérieure avec des chaises longues et des flotteurs pour les enfants et les parents. Cette plate-forme a une nouvelle tuile Californie et chaises hautes pour voir les couchers de soleil spectaculaires. 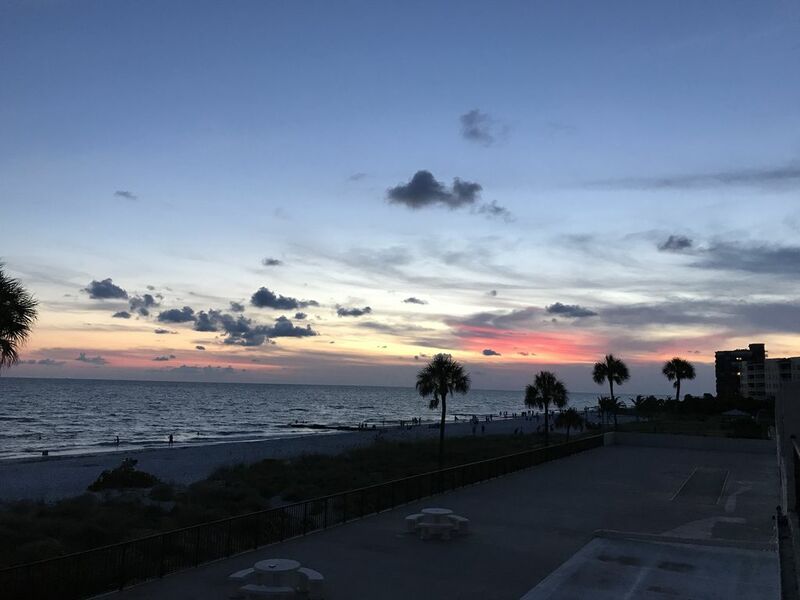 We have had many wonderful vacations at Madeira Beach! We love the location of unit 301! The extra room on the patio is wonderful and the view of the gulf and pool are perfect. You can experience the beautiful sunsets from the condo. We call it "our happy place" and after staying in Ocean Sands most summers for 30 years, we still love our family time there! There is not a better pool on the beach! It is huge and the steps make a great place for little ones to play. It is kept clean and the grounds are manicured beautifully. The beach is only a few steps away and it has never been crowded. The gulf is warm and it is fun to find sand dollars and starfish on the sandbar. The condo is renovated and well supplied. It is within walking distance of restaurants, tennis, parks, and John's Pass. It is only 25 miles from the Tampa airport. I am ready to return next summer! We have made wonderful memories there! This property is nicely renovated and a beautiful place for a family vacation. We have stayed at this property for several years and love it each and every year. We have been going to Ocean Sands for many years and this is our favorite unit. We love the large balcony space, the location and the unit space. It has been beautifully updated. It is clean and well-kept. It is a family-friendly unit. Our children look forward to re-visiting every year. The owners and property manager are fabulous to work with and always make sure the stay is as you expect. We will continue to stay in this unit for many years to come. It is made to feel like a home away from home, and that is how we view it. We take care of it as if it is our own home while we are there and look forward to returning annually. I would highly recommend this property to anyone who is looking for a peaceful, relaxing vacation. The gulf view is amazing. It is a beautiful location and a remarkable unit.